Brilliant sports car. Good price. Outstanding fun. You’re quite familiar with this car by now, as just about any driving enthusiast is already. That’s because Toyota and Subaru made the bold and, dare I say, ballsy choice a few years ago to develop from scratch an affordable, rear-wheel-drive sports coupe program at a time when that exact segment appeared to be all but dead or dying. 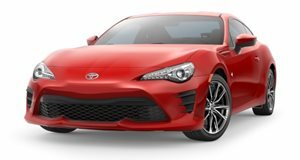 But the Scion FR-S and Subaru BRZ prevailed and, despite the Scion brand’s passing, the car itself still lives on as the Toyota 86. We previously sampled the FR-S but the chance to check out the facelifted 86 was an opportunity we couldn’t pass up. Power still comes from the 2.0 flat-four "Boxer" engine, only now it’s been given a slight power boost to 205 hp and 156 lb-ft of torque. It’s not much but it’s something. Our Ablaze Red tester also came equipped with a stick; no need to spend $720 more for the six-speed slush box. Performance? It's only OK. Zero to 60 mph happens in 6.2 seconds and top speed is about 134 mph. Remember though, the Toyota 86 and Subaru BRZ were never intended to be about high performance, but as appropriately powered driver’s cars. And thanks to said power increase along with stiffer front springs and dampers, the Toyota 86 is still that wonderful and affordable sports car that we pray still has a future.